[T]his was a perfectly respectable Falstaff. It just wasn’t the superb Falstaff the occasion called for….This level of micro control is put to the test in Falstaff. For this sparkling comedy based on Shakespeare’s The Merry Wives of Windsor, Verdi wrote a quicksilver score that, when conducted precisely, feels improvisational. But when the conducting is off even by a hair, the music seems to lurch and halt like a car whose driver is riding the brakes. And that’s how Mr. Levine’s Falstaff felt: We reached our destination, but the ride was a little rough. 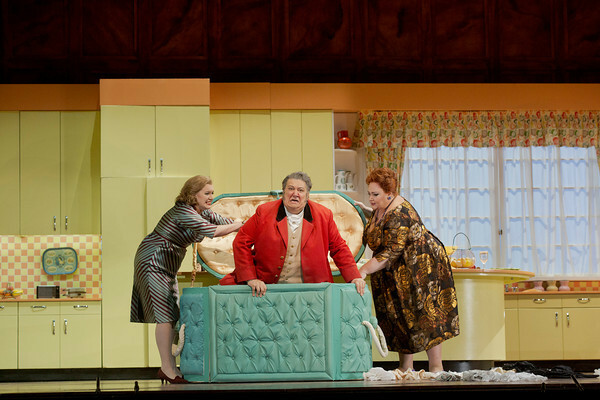 The opera turns on a dime between slapstick, romance, and poignancy, but the production, while good-natured, isn’t so agile….Falstaff is a James Levine signature piece and he brings a bounce and light to the music that was missing from the production (particularly in the last act). It’s quick, light, and transparent, but quiet when it needs to be. That being said, there were a few ensemble coordination issues in Act 1, particularly between the two sides of the stage (men on one side, women on the other). Things improved…. Ambrogio Maestri, however, was not a particularly interesting Falstaff. He’s got the big round voice for it, and the round shape, but while musically fine it was a one-dimensional characterization, little more than a teddy bear….As Alice Ford, Angela Meade put in a valiant effort, acting-wise, and this was by far the most animated performance I’ve seen from her….Nanetta’s music is a gift to any light soprano, and the Met has fortunately cast Lisette Oropesa, possibly the best singer they have in this Fach….On the low side, Stephanie Blythe as Mistress Quickly sounded like a very loud trombone. This role is her ideal Fach as well–she’s much better here than she is in higher Verdi stuff. [W]hile conventional productions might assume Verdi and his librettist Boito created a silly, self-deluded shell of a knight descending to society’s dregs, Carsen shows Falstaff in upper-echelon men’s clubs and someone to be ridiculed only at your own risk….Carsen went far to solve the central problem that makes the opera more respected than loved. For all its distilled, compact music, Verdi’s final opera often seems to be an enshrinement of buffoonery while the soprano/tenor love interest have far-less-than-usual stage time and everybody else has a high old time practicing the un-exalted human pastimes of humiliation and revenge…. Now for the reservations: The clear narrative lines that are typical of Carsen broke down a bit in larger crowd scenes. The bigger problem is that, aside from the coup-de-theatre kitchen and and the nighttime scene in the final act, Paul Steinberg’s sets are surprisingly plain with a lot of bourgeois wood paneling. The Met’s much-loved 1964 Franco Zeffirelli production, which dated back to the old 39th Street house, will be missed, but Robert Carsen’s new take on Verdi’s final opera is a true delight….Carsen sets his version in late-1950s London, well after the war but just before the Mod revolution. It was a time when existing social systems were crumbling, and Carsen has great fun contrasting the twilight of aristocracy with the rise of the middle class. Carsen is known for his trademark motif of theater-within-theater for most of his productions. He manages to ignore it for most of the work but manages to get it in during the final choral fugue….This “Falstaff” is one of the finest productions of general manager Peter Gelb’s tenure and the perfect way to end the 2013 bicentennial celebration of Verdi’s immortal genius.